He also indicated his support for a City Council bill that would "ban single-use plastic foodware in private restaurants and establishments," according to AM New York. "Today we say no to plastics, we say no to fossil fuels," de Blasio said from a recycling center. The mayor said the effort was part of the city's overall goals to combat climate change and reduce carbon emissions. "I'm talking about a whole variety of things we got used to relying on but don't need anymore," de Blasio added. "All those things we have alternatives for. City agencies will shift to compostable or reuseable by the end of 2019." 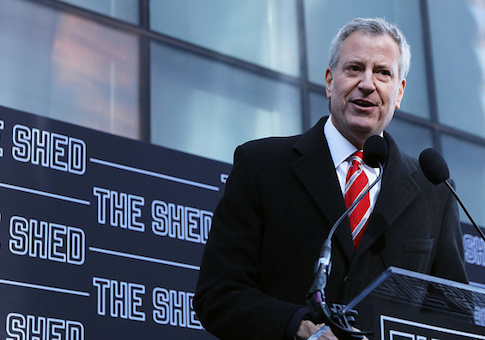 De Blasio is thought to be mulling a presidential bid but has yet to formally announce. He has made a smattering of trips to early voting states like Iowa and New Hampshire. New Yorkers in particular thus far seem to be underwhelmed at the idea of a de Blasio presidential run. In a January poll by Quinnipiac University, de Blasio was the fifth preference of New Yorkers when ranking their home state politicians who might be running for president. Former New York City Mayor Michael Bloomberg topped the list, followed by Gov. Andrew Cuomo, Sen. Kirsten Gillibrand, and Representative Alexandria Ocasio-Cortez, all of whom are Democrats. Bloomberg and Cuomo have indicated they will not run, and Ocasio-Cortez does not meet the constitutional age requirements to run for president. Gillibrand, meanwhile, has launched her campaign. De Blasio's unfavorable ratings were also significantly higher in that poll compared to others. An article in the New York Times from late March noted that Pete Buttegieg, mayor of South Bend, Indiana, was generating far more presidential buzz in the city than the hometown mayor. "Both men are considering a presidential run but only one of their potential candidacies seems to be taken seriously," the Times report said. This entry was posted in Issues and tagged Bill de Blasio. Bookmark the permalink.